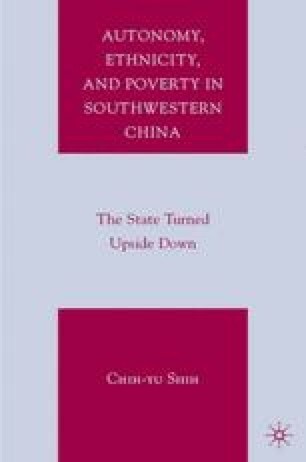 Chapter 3 tells how cadres mediating between the state and the villagers might develop views or feelings of their own. In addition, villagers do not always accept the image of cultural backwardness passively. The notion of helping the poor ecologically has actually had some sense of local subjective feelings in ethnic Western Hunan. The villages are ready to take the state’s ecological turn seriously and to reevaluate their relationship with the environment and the state. In fact, the state and its ecological Helping-the-Poor programs together constitute an important part of the nascent identity in a Western Hunan township. This is not unlike the situation in Chapters 4 and 5 in which the state contributes positively to the evolution of self-consciousness in the local ethnic communities. Here, the contrast is also present in that the state is both an initiator of the change in self-consciousness and a convenient “other” to differentiate the local identity.